health, whether preventing disease or managing a chronic illness. Self-management goes beyond traditional health education that focuses on disease-specific self-care interventions. 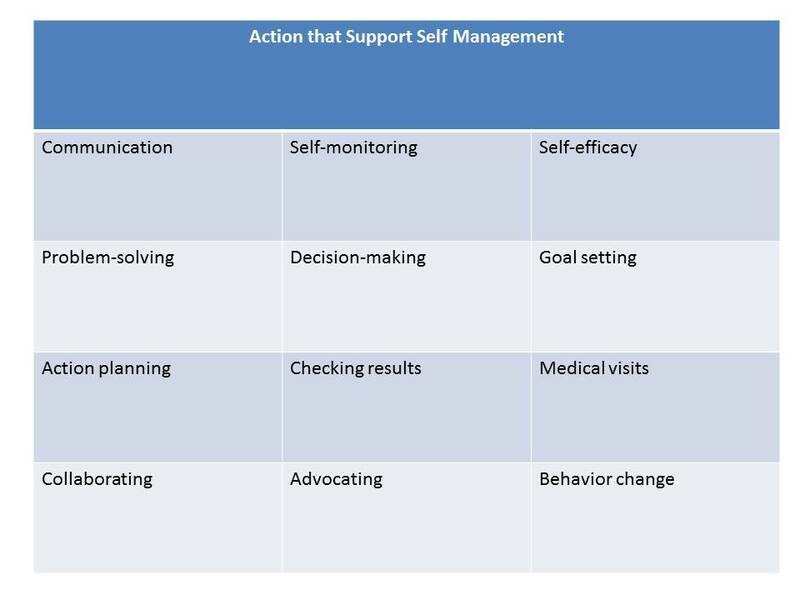 As a multi-faceted approach to health, self-management builds skills in self-monitoring, problem-solving, self- efficacy, decision-making, and communication, and then actively applies them to health-related situations. Practicing self-management improves the exchange of information between the person and their health providers. The person becomes their own health advocate to get the best and most appropriate care for themselves, which improves health outcomes. The aim of self-management is to empower an individual to take control of their health. Using self-management techniques, a person can detect changes in their health and take the necessary action to prevent it from becoming a chronic condition. Practicing self-management improves the ability of a person to manage a chronic illness, making cognitive, emotional, and behavior changes necessary to improve their quality of life. It means being an active participant by asking questions, appointing a health advocate and taking them with you to your appointments, understanding your medications, learning about your chronic illness, and making lifestyle choices that will improve your health.